Congratulations to our Associate Editor, Professor Xiao Cheng Zen, who has been awarded the Royal Society of Chemistry Surfaces and Interfaces Award for 2017 for his development of a unified theory to understand the relationship between structure and properties of nanoscale materials at surfaces and interfaces. Xiao Cheng Zeng is currently at the University of Nebraska-Lincoln, where his main research interests cover the physical chemistry of confined water, ice, and ice hydrate in nanoscale; ions and radicals at air/water interfaces; heterogeneous catalysis on supported gold clusters; and computer-aided design of low-dimensional materials including liganded gold clusters and perovskite solar-cell materials. He is the recipient of many awards, and is a fellow of the American Association for the Advancement of Science (AAAS), the American Physical Society (APS), and the Royal Society of Chemistry (FRSC). He has published 475+ articles in refereed journals (Google Scholar h-index: 70; citations 17000+). Four articles were featured in Chemistry World (RSC) and ten papers were featured in Chemical & Engineering News (ACS). 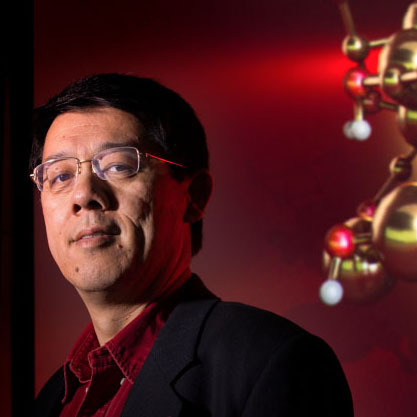 Professor Xiao Cheng Zen has been an Associate Editor for Nanoscale since 2012, and we congratulate him for his success! Graphene oxide (GO) is a versatile material with applications ranging from electronics to energy storage and biosensors. As a biosensing substrate, GO has many favorable attributes such as low cost, high signal-to-noise ratio, and the ability to efficiently quench fluorescence. Scheme for the GO-aptamer based sensor for detection of thrombin. This ability to quench fluorescence has inspired a range of biosensors using GO and Förster resonance energy transfer (FRET) for the sensitive detection of proteins using labelled probes, such as aptamers. However, the target proteins in such assays can non-specifically adsorb onto the surface of GO, thereby reducing the sensitivity. To address this, Gao and co-workers implemented the use of polyethylene glycol (PEG) to prevent the non-specific adsorption of thrombin onto GO while implementing an aptamer-binding assay. The authors report that the detection limit could be improved by optimizing the GO:PEG concentration. This manuscript helps to establish GO as promising tool in the biomedical and biotechnology fields. Dr Lee Barrett is a guest web writer for the Nanoscale blog. Lee is currently a postdoctoral researcher in the Centre for Molecular Nanometrology at the University of Strathclyde. His research is currently focused on the development of nanoparticle-based sensors and surface enhanced Raman scattering (SERS). Follow him on Twitter @L_Bargie. An in-situ synthesis of biocompatible fluorescent carbon nanoparticles (FCNs) is reported for targeted bioimaging. The nanoparticles were formed via dehydration of hyalurinic acid (HA), and through careful alteration of the carbonisation times, the total content of HA and fluorescence in the carbon nanoparticles could be controlled. Sharker et al. then compared two colloidally stable FCN samples; one partially carbonised sample that still contained some HA (HA-FCN), against a “non-specific” fully carbonised sample containing no HA (FCN). Before in vivo testing, both sets of particles were tested on different cell lines at dosages up to 1.0 mg/ml and were found to not affect cell viability. Interestingly, HA-FCNs showed more uptake than the non-specific FCNs, and were internalised more various cell lines; including cancer cells. This is speculated to be due to the over expression of the CD-44 receptor which can facilitate uptake of particles containing targeting molecules such as HA-FCNs. In vivo bio-distribution studies showed more accumulation of HA-FCNs in tumours pre-implanted into mice compared to FCNs, when particles were injected into the tail vein. This is expected to be of enormous potential in not only bioimaging, but also drug delivery and diagnostics. 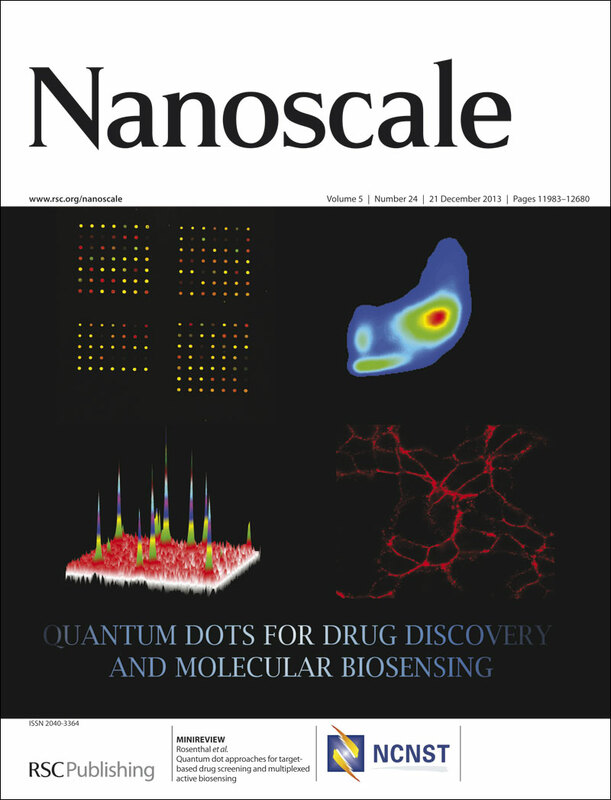 Nanoscale Issue 4 of 2014 out now! 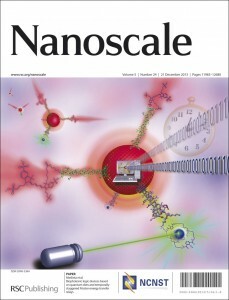 Nanoscale is delighted to present its current issue. Towards biocompatible nano/microscale machines: self-propelled catalytic nanomotors not exhibiting acute toxicity is the article highlighted on the outside front cover by Elaine Lay Khim Chng, Guanjia Zhao and Martin Pumera. The inside front cover features an article on Design of advanced porous graphene materials: from graphene nanomesh to 3D architectures by Lili Jiang and Zhuangjun Fan. Nanoscale Issue 3 of 2014 out now! Size-dependent propagation of Au nanoclusters through few-layer graphene is the article highlighted on the outside front cover by Simon R. Plant, Lu Cao, Feng Yin, Zhi Wei Wang and Richard E. Palmer. The inside front cover features an article on Curved polymer nanodiscs by wetting nanopores of anodic aluminum oxide templates with polymer nanospheres by Mu-Huan Chi, Yi-Huei Kao, Tzu-Hui Wei, Chih-Wei Lee and Jiun-Tai Chen. Nanoscale Issue 2 of 2014 out now! One-step synthesis of carbon nanosheets converted from a polycyclic compound and their direct use as transparent electrodes of ITO-free organic solar cells is the article highlighted on the outside front cover by Su-Young Son, Yong-Jin Noh, Changsuk Bok, Sungho Lee, Byoung Gak Kim, Seok-In Na and Han-Ik Joh. The inside front cover features an article on Synergistic influence of polyoxometalate surface corona towards enhancing the antibacterial performance of tyrosine-capped Ag nanoparticles by Hemant K. Daima, P. R. Selvakannan, Ahmad E. Kandjani, Ravi Shukla, Suresh K. Bhargava and Vipul Bansal. Nanoscale Issue 1 of 2014 out now! Strong localized surface plasmon resonance effects of Ag/TiO 2 core–shell nanowire arrays in UV and visible light for photocatalytic activity is the article highlighted on the outside front cover by Hyeonjin Eom, Joo-Yun Jung, Yosep Shin, Sarah Kim, Jun-Hyuk Choi, Eungsug Lee, Jun-Ho Jeong and Inkyu Park. The inside front cover features an article on Photocatalysts with internal electric fields by Li Li, Paul A. Salvador and Gregory S. Rohrer. 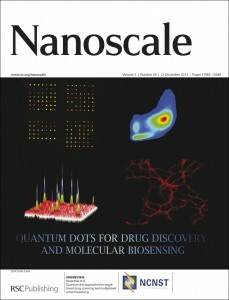 Nanoscale Issue 24 of 2013 out now! Biophotonic logic devices based on quantum dots and temporally-staggered Förster energy transfer relays is the article highlighted on the outside front cover by Jonathan C. Claussen, W. Russ Algar, Niko Hildebrandt, Kimihiro Susumu, Mario G. Ancona and Igor L. Medintz. The inside front cover features an article on Quantum dot approaches for target-based drug screening and multiplexed active biosensing by Oleg Kovtun, Xochitl Arzeta-Ferrer and Sandra J. Rosenthal.